Are you eying one of the many top notch smartphones that Verizon is currently offering, or how about some of the juicy ones that are expected to arrive down the road – like the HTC Merge? But when you dig deep down into your pockets, you find nothing but an empty wallet filled with just some loose change. 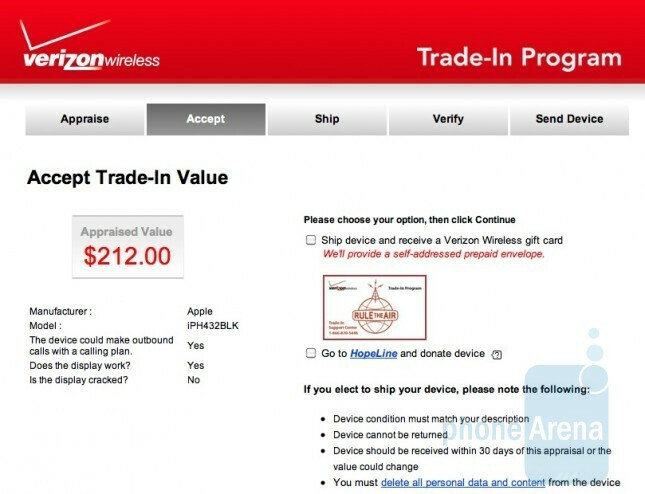 If you're trying to save up for a future purchase and have some spare phones laying around the house that aren't being used, you may want to check out Verizon's trade-in program that they're launching. Similar to a host of other services currently available, you essentially go online to www.trade-in.vzw.com and enter in some information regarding your used or new phone. During the process, it'll ask specific questions like the condition of the device – whether or not it's working or perhaps damaged. From there, you'll eventually get an appraisal amount which would be sent to you in the form of a Verizon Wireless gift card. Although some devices will fetch more money than others, an Apple iPhone 4 32GB version for example, will dish up approximately $212 – which can be seen as being pretty low, but then again, can be okay for some. If you do decide to send it, there is an option during the process which will allow for a pre-paid box to be shipped to you. Additionally, there is also an option to donate your phone to charity if you wish to do so. So if you don't want to hassle yourself by putting up your phones on auctioning sites or even something like Craigslist, this may become especially useful to you. bestbuy.com/tradein has way better values. You can also trade in pretty much any used electronic item. I have used them multiple times. I appraised some of the older phones I had such as the LG enV=$0, the Samsung Intensity flamingo red=$0, The LG Venus=$12 and my moms new Samsung Rouge=$12. Personally I find their system is under valuing phones that are no longer carried by cellphone carriers. If they are stating used phones cost that much for us to sell them then why are consumers paying full price for "certified pre-owned" devices from Verizon Wireless? For instance the LG Chocolate touch that Verizon sells consumers cost us $259.99 full price even though it is preowned, but if we sell it to them we get $8 for it. I think Verizon should re-think this method of appraising phones. I do know a little about the cellphone industry and it does make sense to lower the value, but not all the way. Also the CPO phones are in some cases worse than the brand new phones. I know this because I have had many replacement phones over the last two years; ranging from the Venus, enV2, Chocolate 3, Dare and Intensity; with Verizon and half of the replacement phones, under the same as CPO inspection, were broken before I event got them. Mine are worth 0 dollars??????? ?